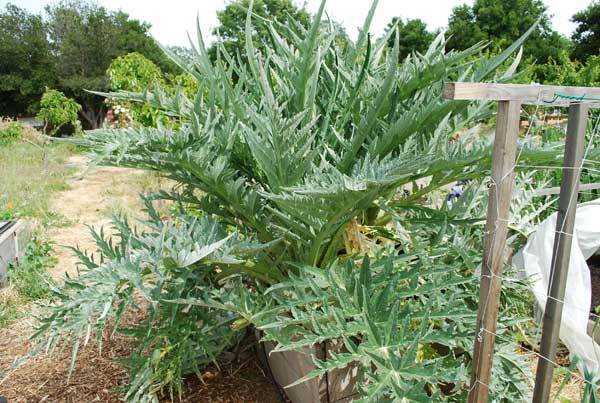 Growing artichokes (Cynara scolymus) may seem exotic, but they’re easy to grow even as annuals. Their ancestors were thistles, and in good soil they show some of that rampant growth that thistles show when growing in good soil. Many artichoke varieties can overwinter in zone 7 and above, but some varieties are bred for heavy yields in a single season, given the right soil amendments and conditions. Artichokes need a long growing season, so northern and alpine gardeners should start them indoors under lights 8 weeks before the last frost date. Sow seeds ¼” (0.6 cm) deep, ¼” (0.6 cm) apart, and cover with ¼” (0.6 cm) of fine vermiculite or sifted potting soil. Artichoke seeds germinate in 10-20 days—earlier, when kept moist at 65-70° (18-24° C). Transplant seedlings to larger pots as soon as they’re strong enough to handle. Expect 70% germination, so sow heavily. Some artichoke varieties are frost hardy in zone 7 and above, and can tolerate winter low temperatures as low as 14° F (-10° C) if well-mulched. To overwinter plants in cooler zones, cut them back to 8-10” (20-25 cm) in late October, then cover the stump with 10” (25cm) of straw or dead leaves to protect from frost. In the spring, uncover the stump to let it sprout. Where I live in Zone 9, we plant artichokes in the fall, and let them overwinter through our rainy season unprotected. You can broadcast seeds or plant seedlings, both work. The plants grow through the winter, put on a big burst of growth in March and April, then flower in May. We eat the big, dense artichokes from the middle of the plant first, then harvest the abundant baby chokes that follow until mid-June. In July, with the peak of summer heat coming, we cut them back. They re-sprout in August, leaf out in the fall, and grow through winter, then flower again the next spring. Each plant produces for 4-5 years, with the chokes getting smaller and more numerous in the later years, because they’re producing from side-branches off the main stem. When the artichokes start getting smaller than you'd like, divide the crowns into several divisions, and transplant them into their own space. They'll produce for several more years before you have to start again from seed or fresh seedlings. When growing artichokes, time your planting so seedlings will have 10-12 days with temperatures below 50° F (10° C), to encourage early bud set and longer fruiting. While mature artichoke plants have some frost tolerance, seedlings are vulnerable, so protect seedlings from nighttime and early morning frost during this time. Although their ancestors were weeds, artichokes are bred for richer soils, so amend the soil with 2-3” (5-8 cm) of good garden compost or composted manure and give these large plants plenty of space if you want a good yield. Work the manure or compost into the top 10” (25 cm) of soil before planting, along with some dolomite lime, dried, ground eggshells, or ground oyster shells for supplemental calcium. If you don’t have access to good compost or manure, use a good organic vegetable fertilizer like Dr. Earth Organic Tomato, Vegetable, and Herb Fertilizer . 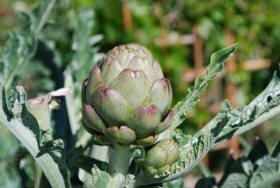 Artichokes can handle alkaline soil conditions better than most garden vegetables. Optimal pH for growing artichokes is 6.5-7.0. See Changing Soil pH for ways to adjust soil pH. Artichokes are space hogs, whether you’re growing artichokes in a raised bed, or with single cultivation (soil prepared to 1 shovel depth). Artichokes should planted about 3 feet (1 meter) apart, but some large varieties might need 4-foot (1.2m) spacing. If you’re growing artichokes as perennials, cull out small, weak, albino, or low-yielding plants after harvest, and allow a final spacing of 4-5’ (1.3-1.7 m) between plants. 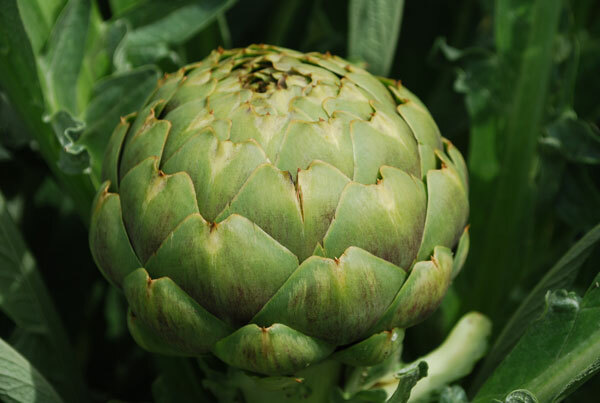 Growing artichokes requires regular, steady water, 1-1 ½” (4-5cm) per week. Lots of water at bud set in spring or summer helps produce large, dense, chokes. Artichokes are heavy feeders, even if you build organic soil amendments into the soil at the start of the season. Just before they start to bud out, side-dress with composted chicken manure (1-2 lbs (0.5-1 kilo) or a good organic fertilizer like Dr. Earth Organic 5 Tomato, Vegetable, and Herb Fertilizer , and water thoroughly. Artichokes don’t need a lot of care, once established. Plant them in a rich soil, give them regular water and occasional fertilizer, and harvest them before the bud scales open, that’s about it, when you’re growing artichokes as annuals. If you’re growing artichokes as perennials, you have to cut the plants back after they flower, and mulch them to keep them from freezing in colder zones. You might get another couple years of productivity out of the plants if you divide them after the first 3 years, and plant the divisions as separate plants. 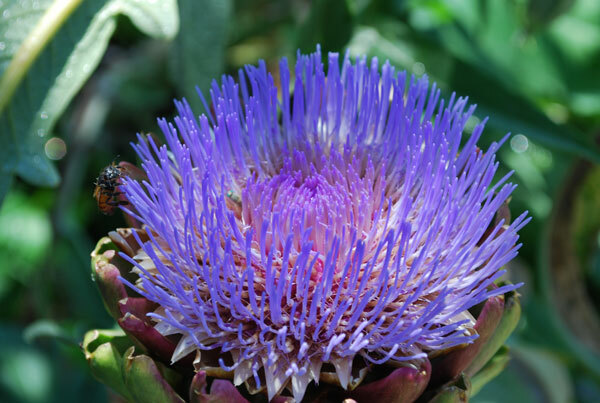 Artichokes have few insect pests, and suffer from few diseases. Western pocket gophers will munch the roots, so in areas where pocket gophers are a problem, plant artichokes in wire baskets or wire cages to protect the roots. Since artichokes have few pests, they don’t really need companion plants to deter pests. Artichokes are heavy feeders, so cool-season nitrogen-fixing plants like peas or vetch are good planted nearby. Artichokes are huge plants, so they don’t really make good companion plants for other crops, especially in small gardens. If you let some of the buds get by without harvesting, they make large, spectacular flowers that feed honey bees, bumble bees, and other pollinators. Growing artichokes in containers is easy—provided the container is large enough. Artichokes have large root systems, and need a large soil volume—or a rich potting soil in a smaller volume, and much more frequent watering—to form heavy, solid buds. 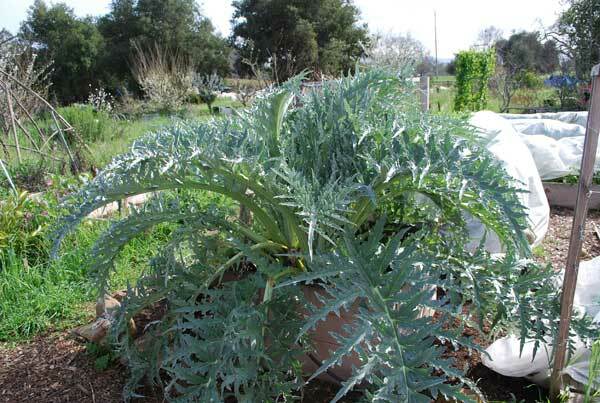 This artichoke gets all it needs in a 24” x 24” x 24” (60 x 60 x 60 cm) box with plenty of good compost in the potting mix. See Growing Vegetables in Containers for more information. Waiting too long to harvest is the biggest mistake gardeners make when growing artichokes. Harvest artichokes as soon as the bottom bud scales start peeling away from the bud. This assures the largest and most tender artichoke hearts—with less choke—and reduces the risk of aphids and their ant attendants moving into the buds.